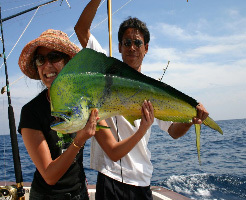 Fishing around Bali is excellent with many types of fishing tours available for all levels of skill and experience. 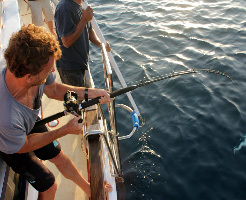 From small species of reef fish to Bass, Baracuda and large game including Marlin; the waters around Bali have it all. 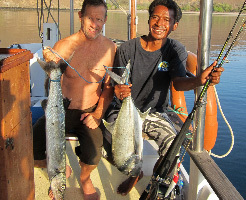 You don't have to go far off the coast of Bali before big game fish are plentiful. 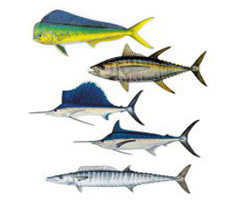 If fishing is your focus for your charter trip then make sure you choose a boat with excellent equipment. The charter boat "Padi" has several Penn international 50 reels, Penn rods, and a range of good quality gear that will suit both experienced fisherman and amateurs alike. It also has a mountable stainless steel BBQ so you can cook up your catch immediately. If you have a particular species of fish you wish to target we can arrange for the crew to have the most appropriate equipment ready and take you to the location that will maximise your chances. 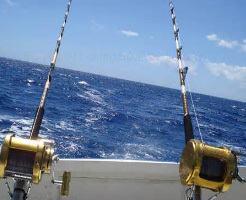 Trolling can be done along the way, and big game fish are generally caught in abundance. 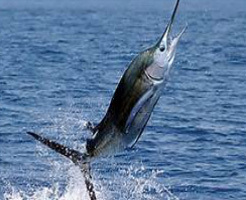 Bait fishing, bottom bashing, casting lures, trolling and live baiting is all possible when you choose to go on a private fishing trip we provide. Night fishing for deep sea Bass and Mahi Mahi is an excellent option for the serious fisherman and for the those who are really game, hand picking lobsters by torch light is an exciting adventure. Spear fishing packages can also be arranged by special request. Contact us to discuss what you would like from your charter experience, and we will happily recommend a boat and package to suit!